Confession #1: I’m addicted to technology. Confession #2: I’ve seen “He’s Just Not that Into You” and I liked it. 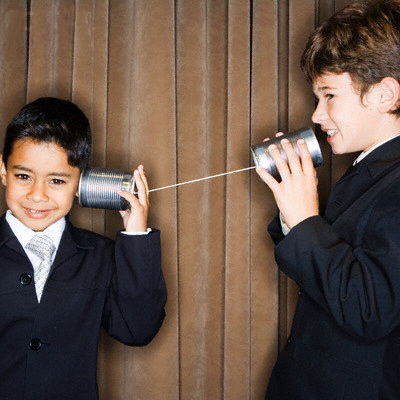 Confession #3: I need an easier way to communicate with people. Remember back in the day when you had to convince your parents to get a second land line so that you could stay up at night talking to that special someone? Remember when you used that same tactic to get your parents to let you install that AOL disc you got at Blockbuster video after they drove you there to rent some Pauly Shore comedy? Remember how that was the last time you were able to consistently rely on one form of communication with someone? I do. Now, let me make it very clear that I’m not trying to be the old fuddy duddy who sits on his porch yelling at kids for their loud music and their internets… I’m really not. I am however, trying to be that guy that watches a chick flick like “He’s Just Not that Into You” and tries to pry some small glimmer of actuality from the movie – here it goes. I had this guy leave me a voicemail at work, so I called him at home, and then he emailed me to my BlackBerry, and so I texted to his cell, and now you just have to go around checking all these different portals just to get rejected by seven different technologies. It really got me thinking about how I communicate on a day-to-day basis and how I regard those different avenues of communication. Text – This is my default for my friends, family (those that text – which my mom just now got into), and colleagues. It’s quick, it’s easy, and I can do it while eating. Texting gives me the ability to think before I speak (yay editing!) and make sure my thoughts are well-written. Phone Calls – I don’t have a land line, so my cell phone is basically my real-time connection to the world. If you’ve got my number, chances are I trust you enough to let you call me in the middle of the night. I’ll admit, I don’t talk to people on the phone much, though. My AT&T call list looks a little sad. IM – Ah, instant message. What once was reserved for late-night chats with my HS girlfriend is now the instant mode of communication with my friends. I use Digsby, so I can talk to my friends on MSN, Facebook Chat, Gchat, AOL Instant Messenger, and probably more… Needless to say, this can become a distraction, so I end up ghosting (appearing offline) a lot. Twitter DM – Not gonna lie, I’m not a huge fan of the Twitter DM. It isn’t because I don’t find the DM function of Twitter to be useful, but because for me the people that end up sending me a DM also have my cell phone number and could just as easily text me – especially when you consider I get an alert on my cell when I get a DM. At the end of the day, it doesn’t really matter how or where we’re able to communicate, but sometimes I just wish I was using Wuphf .